“The great edifice will be 30 years old in December. It has irritated people of taste and democratic inclinations for the better part of three decades now. Over its entrance is inscribed the dedication ‘Dem Deutschen Volke’ (‘To the German people’). But on its dome, 75 metres above street level, is a huge golden crown, a massive weight, completely out of scale with the dome and utterly at variance with the dedication. 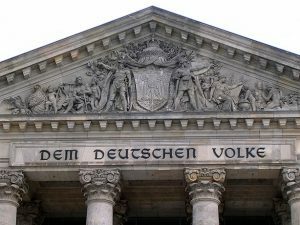 Today, on the opening day of the Reichstag, they have been packed since two o’clock… Here in the German Reichstag, each party has not only its own political convictions but also its own ritual. There is no sense of overall decorum. The 79-year-old veteran president, who has a weak voice, receives a call from the right to “Speak up!”… And where have I heard that whistling coming from the communist benches? It was in high school, wasn’t it, in my junior year? Is it that I’ve outgrown it because I’m apolitical? Foreign ambassadors… are sitting in the box. The eyes of America, France, and Italy are directed at the representatives of the German people. And what do they see? The goose-stepping of the nationalists. Wrangling among the communists. Ludendorff in dark glasses. The apolitical observer cannot understand why, more than any other professional grouping in the world, German politicians are so driven to make asses of themselves before they’ve even embarked on their politics, which are a further reservoir of absurdity.